Mayapple, Podophyllum peltatum, is a low herb that grows in the woods of Eastern USA and Canada. 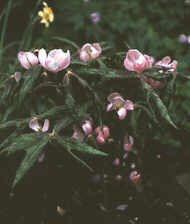 The plant has a rhizome that can grow up to one meter long. Previously, an extract from the root was produced by using alcohol. The extract was then concentrated and diluted hydrochloric acid was added. Precipitation forms which was washed, dried and subsequently ground to a powder. This powder, which is known in the pharmaceutical world as podophyllum, contains 20% podofyllotoxin, 10% beta-peltatin, and 5% alfa-peltatin. In early 20th century podophyllum was mainly used as a laxative. Its laxative effects are principally due to the presence of peltatin. Podophyllin was used for venereal warts, but in modern medicine we use podophyllin instead in its refined form, podophyllotoxin. Both peltatin och podophyllotoxin have inhibiting effects on tumours and have therefore been thoroughly studied. Various derivatives of podophyllotoxin have been produced, e.g., teniposid which is mainly used against cancer of the bladder, and etoposid against other types of cancer. Another species Podophyllum hexandrum (synonymous: P. emodii) is native of the Himalayas. Podophyllin, produced from this species, contains up to 40% podophyllotoxin and no peltatins. Therefore it is much less of a laxative than podophyllin from P. peltatum. P. hexandrum is used today for the refinement of podophyllotoxin for drug manufacture. Modern research has shown that podophyllotoxin is not only effective against cancer but is also useful in the treatment of genital warts and other viral illnesses. Clinical tests have shown that podophyllotoxin or structurally similar compounds have positive effects on other diseases, such as psoriasis, rheumatoid arthritis, Alzheimer and malaria. 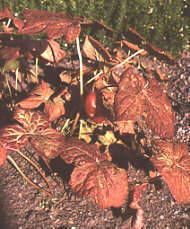 A Mayapple plant with fruit in the Botanical Garden, Uppsala University. Bohlin, L. and Rosén, B., Podophyllotoxin derivatives: drug discovery and development. Drug Discovery Today 1:343-351, 1996.